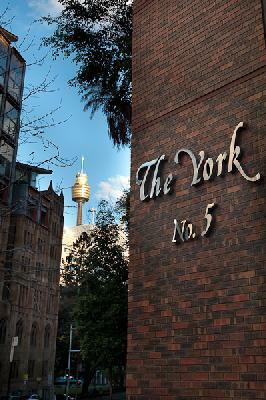 Only 5 Minutes from Sydney Harbour, The York by Swiss Belhotel is one of Sydney's best located Suites and Residences. The York enjoys excellent transport links and offers stylish and contemporary 4 star studios, 1 & 2 bedroom self conatined suite accommodation. Whether it is for business, recreation or simply leisure. you will find it all at The York by Swiss-Belhotel, Sydney's most centrally located suites and residences. All types of travellers can take advantage of the discount accommodation at the The York by Swiss Belhotel, as well as the range of modern amenities including currency exchange services, faxing facilities, guest laundry, gym & fitness equipment, lift, restaurant, room service, sauna, spa, outdoor swimming pool, tour desk, 24 hour reception, babysitting service and daily housekeeping. You will enjoy this central CBD location, minutes to almost every spot in the city, but quiet enough to relax. For business and pleasure you will surely find The York by Swiss Belhotel to be Sydney's finest apartment hotel. Nearby Attractions : It is a five minute walk to The Rocks, Harbour Bridge, Circular Quay, Opera House and 10-15 minutes to Darling Harbour and Sydney Casino. Also ot is near all shopping, theatres, tourist attractions and restaurants. 2 Bedroom 2 Bathroom Suite : Sleeps up to 5 guests on 1 Queen & 2 Single Beds + 1 Rollaway Bed Extra. 2 Bedroom Suite : Sleeps up to 4 guests on Bedding Subject To Availability . Deluxe 1 Bedroom Suite : Sleeps up to 3 guests on 1 Queen Bed + 1 Rollaway Bed Extra. Deluxe 2 Bedroom 2 Bathroom Suite : Sleeps up to 5 guests on 1 Queen & 1 Double Bed + 1 Rollaway Bed Extra. Deluxe 2 Bedroom Suite : Sleeps up to 5 guests on 1 Queen & 2 Single Beds + 1 Rollaway Bed Extra. Deluxe Executive Suite : Sleeps up to 5 guests on 1 X Queen Bed, 2 X Single Beds, 1 X Sofabed . Deluxe Studio Suite : Sleeps up to 2 guests on 1 Queen Bed, Or 2 Single Beds. Deluxe Two Bedroom Ensuite : Sleeps up to 5 guests on 1 X Queen Bed, 2 Single Beds, 1 Rollaway Bed Extra Cost . Executive One Bedroom Suite : Sleeps up to 3 guests on 1 Queen Bed .